At a High Performance 1 seminar not long ago, a midget AAA coach shared his yearly plan with the other attendees. I rather suspect he shocked them with the detail. There were macro and micro cycles, phases… the entire gamut of events of how a seasonal plan for elite athletes could be done. I can’t say whether or not he was able to stick with the plan or even if he was an effective coach. But the plan was impressive—and overwhelming. Over the years, I’ve tinkered with various sorts of plans and tried some with organizations where I’ve been a mentor or development director. Indeed, there will always be coaches who like the concepts and others who find it tedious, unnecessary paperwork. The challenge then is to come with a straightforward plan that has enough flexibility to allow for quick changes. Technology has provided an answer. 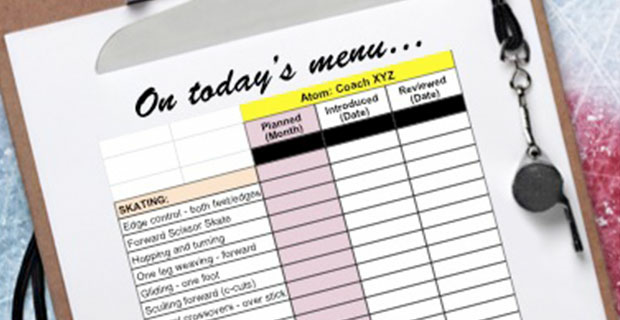 For the longest time, I’d ask coaches for written plans divided into segments, usually month-by-month. They’d fill in what needed to be taught. Not many stuck with it because it was just too difficult to predict in August or September where your team would be developmentally in November or December. Besides, many coaches just didn’t have a handle on the array of skills or tactics available. A great many key items were overlooked. Then I wondered about providing coaches a menu as part of a broader curriculum that was adjusted for each year and level. I created a list of items with the proviso that, no matter when they were taught in a season, the kids would at least be introduced to each one. The flexibility for the coach was to determine which ones to present and when. You can see a tiny portion of the menu in the graphic at the top of this blog. Using the shared google docs platform, coaches simply selected skills from the list and wrote in the months they’d likely be taught. When they were actually taught and reviewed was recorded by date. For instance, a two-foot stop might be planned for October, taught on Oct. 22, then reviewed on Nov. 15. As a shared document, I could see when they were teaching which skills and then follow up by watching practices. If there were three coaches in this age group and level, their menus would be on the same spreadsheet so each coach could see what the others were teaching and when. •	It had a clear objective: provide your kids with instruction on these items. If you can do more, great. If not, what you have is plenty. •	You’re providing your players with a hockey education, so a curriculum is not only appropriate but also necessary. There are a lot ways to create coaching plans. Is it worth a try?